january 1946: london is emerging from the shadow of WWII, and writer juliet ashton is looking for her next book subject. who could imagine that she would find it in a letter from a man she's never met, a native of the island of guernsey, who has come across her name written inside a book by charles lamb. . . .
as juliet and her new correspondent exchange letters, juliet is drawn into the world of this man and his friends -- and what a wonderfully eccentric world it is. 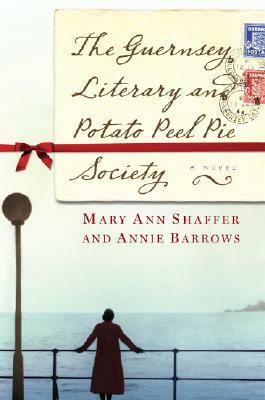 the guernsey literary and potato peel pie society -- born as a spur-of-the-moment alibi when its members were discovered breaking curfew by the germans occupying their island -- boasts a charming, funny, and deeply human cast of characters, from pig farmers to phrenologists, literature lovers all. i simply adored the title 84 charing cross road by helene hanff and your novel has a lot in common with it. granted, ms. hanff's collection of letters was pulled from her own correspondence, but the atmosphere of both books is similar. and it tugs at my heart, which craves pen and papers. which craves finding letters in my mailbox. if you need an evening to whisk you off your feet with romance and words, either of these books will do the trick quite nicely.